We've got some important business to cover in this post, so let's get right to it. We're gonna be all business here. 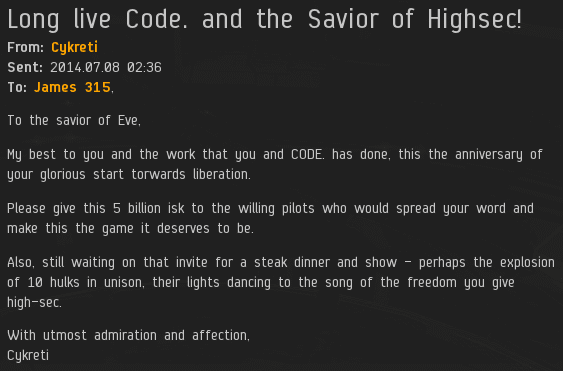 Jer'ith Bodas purchased 1,000 shares, sending us over the 374 billion isk mark and earning him a Supreme Protector's Tip of the Hat™. Derek Bislow, who had very good timing, purchased 150 shares, barely nudging us over the 375 billion isk mark. He earned a Supreme Protector's Tip of the Hat™ of his own--equally valid as all the others. Cykreti's purchase of 5,000 shares sent us barreling over the 376, 377, 378, 379, and 380 billion isk marks and earned her a traffic-stopping Quintuple Supreme Protector's Tip of the Hat™. All these shares were immediately put to good use, refilling the wallets of our army of brave gankers. That's how business gets done in highsec.